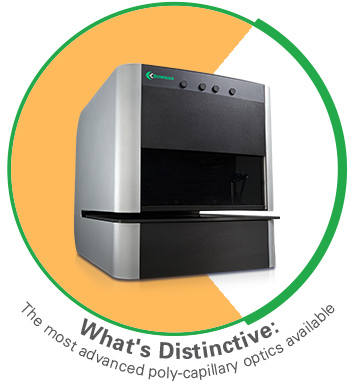 The M Series is the ultimate in high performance for the smallest x-ray spot sizes. The poly-capillary optics in the M Series is more advanced than the O Series, focusing the x-ray beam down to 15μm FWHM. To measure features on that scale, a 150x magnification camera is included. The field of view becomes more limited with higher magnification, so a second camera takes a macro-image of the part to be measured. The dual-camera system allows operators to see the entire part, click the image to zoom in with the high-mag camera, and pinpoint the feature to be measured. The high-precision programmable X-Y stage can be used to select and measure multiple points; the pattern recognition software can also do this automatically. There is a 2-D mapping system that can be used to see the topography of a coating over the surface area of a part such as a silicon wafer. The standard configuration includes the 15μm Optics, and a high resolution SDD detector to process the higher count rates. A micro/macro camera system has one camera with 150x magnification and even higher digital zoom. A programmable X-Y sample stage is also standard. The Optics system has a close focal distance, so samples measured with the the M Series must be flat.